In order to reach a consensus and keep the OPEC+ group united the latest proposal on the table for the upcoming meeting of OPEC+ on Friday and Saturday in Vienna is a modest increase of 300 to 600 k bl/d in 2H1. The proposal before the weekend by Saudi Arabia and Russia was an increase of 1.5 m bl/d. What is most imperative in our view is that the group is adaptive to market conditions going forward. Uncertainties on both the supply side and the demand side are significant. In the eyes of emerging markets (but also Norway) the oil price in local currency is today as high as it was when Brent traded at $110/bl from 2011 to 2014 with demand destruction naturally setting in at such a cost level. Rapidly escalating US – China trade tension is adding to global growth headwinds. With large uncertainties on the supply side the group should stay ready to increase production in order to avoid escalating pain for the consumers. It turns out that Donald Trump’s tweets over the past months that “OPEC is at it again creating artificially high prices” are not just a whim. It is actually one of his core views going back more than 30 years. US lawmakers have tried to pass the NOPEC bill (“Non Oil Producing and Exporting Cartels Act”) for years. It will allow the US Government to sue OPEC for oil market manipulation. Earlier attempts to pass the bill have been blocked by President vetoes. Donald is however one of the big supporters of the bill. This bill is now rolling towards OPEC+ and the group certainly do not want to stir the pot by holding back to much oil creating too high prices. Following Friday’s 3.3% sharp sell-off on the back of Saudi Arabia’s comment that an increase in production is “inevitable” the Brent price yesterday rebounded 2.6% to $75.34/bl as the group was seen to aim for a modest compromise. An increase of 1.5 m bl/d has earlier been seen as the proposal by Russia and Saudi Arabia while the latest proposal said to be discussed is an output hike of 300 to 600 k bl/d. This helped the Brent price to rebound yesterday. This morning Brent is pulling back 0.6% to $74.9/bl following the queue of the sharp sell-off in Asian equities on fear that Donald Trump will add tariffs on an additional $200 billion worth of Chinese goods exported to the US. In order to hold the OPEC+ group together and appease Iran, Iraq and Venezuela who have strongly opposed any increase in production the group now seems to aim for a compromise of a modest increase of 300 to 600 k bl/d at the upcoming meeting on Friday and Saturday this week. It has all the time been argued that any revival in production will be gradual and adapted to market conditions. To be reactive and adaptive to market conditions seems to be even more important now due to significant uncertainties for both supply and demand. The global economy ex the US has been cooling since the start of the year and the US – China trade tension is escalating rapidly with an additional $200 billion worth of exports to the US at risk of getting tariffs. This is not good for global growth and for oil demand growth. The strengthening of the USD, especially versus emerging markets is bad both for global growth and for oil demand growth. An oil price of $75/bl seems fairly modest, neither too hot nor too cold. 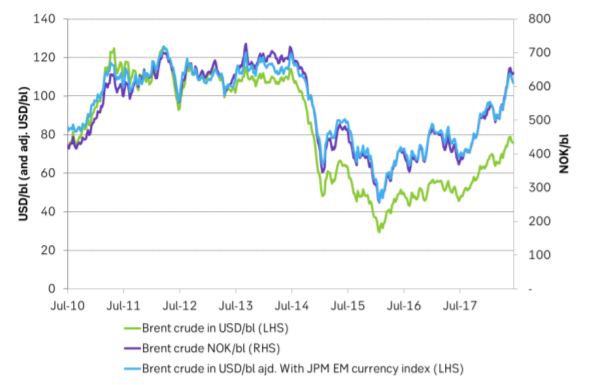 However, if we measure it in local currencies like the Norwegian krone the oil price now is just as high as it was during the period 2011 to 2014 when Brent crude was trading at around $110/bl. The same goes if we take JPM’s EM currency index and adjust Brent crude prices from July 2010. So in the eyes of the emerging market consumers the oil price today is just as expensive as it was during the 2011 to 2014 period. That means that demand destruction is naturally setting in at these prices for the EM’s. And, since EM’s holds the lion’s share of the world’s oil demand growth this is probably not insignificant. It is thus highly important that OPEC+ is sensitive, adaptive and reactive to oil demand conditions going forward. 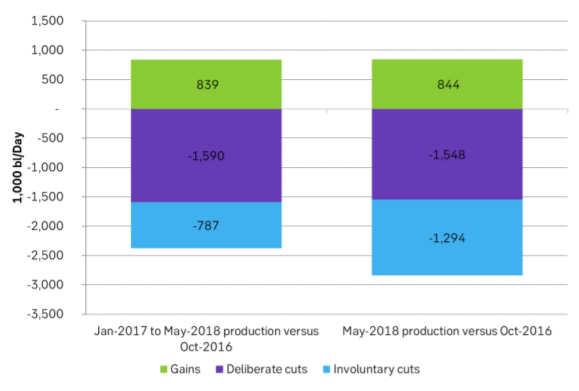 The supply side is of course just as challenging to gauge as production in Venezuela is declining rapidly but could as well disrupt entirely and unpredictably. 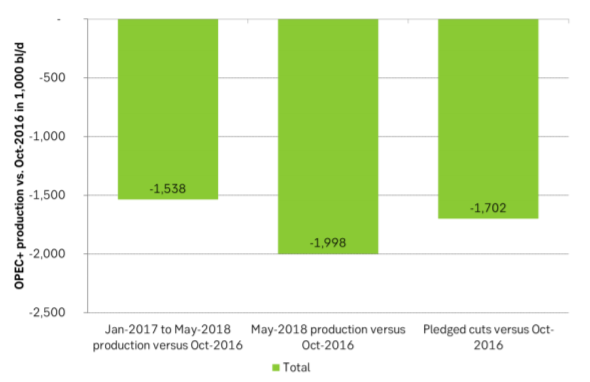 US sanctions towards Iran, a sharp decline in Nigeria’s production in June and increasing violence in Libya where the destruction of two of five crude storage tanks at Ras Lanuf“ may take years” to rebuild are all contributing to a highly unpredictable supply. For a large share of the world’s consumers the oil price is already as high as it was during 2011 to 2014 and OPEC+ does definitely not want to risk that the oil price moves yet higher as the world economy is already facing challenges. Thus adaptivity to market conditions must be the most imperative goal of OPEC+ at the upcoming meeting this week as the goal of getting OECD inventories down to the rolling five year average has been reached. Thus aim for moderate increase in 2H18, but increase more if needed.